You are here: Home / About Us / Services / How can I get a Belding Library Card? How can I get a Belding Library Card? 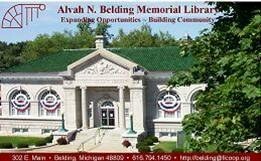 Persons living in the Alvah N. Belding Library service area (City of Belding, Otisco Township, north half of Keene Township, and that portion of Orleans Township in the Belding School District) may apply for an Alvah N. Belding Library card. Present a valid Michigan Driver's License, Michigan Identification Card, or Resident Alien Card documenting identity and a current Belding street address. USE OF ALL LIBRARY RESOURCES, INCLUDING ACCESS TO THE INTERNET. A student card may be upgraded to a full-service minor card when an adult library card holder whose card is in good standing signs for the student's card. A student library card will be upgraded to a full-service card when the student cardholder reaches 18 years of age. 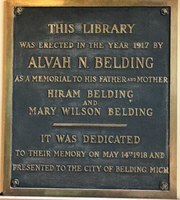 Persons residing outside the Belding service area must make application for a library card at their home library.